PHILADELPHIA – “Major” Samuel Nicholas posed for a photo at a tourist’s request. In a green tailcoat and under a black cocked hat, he made a pompous look as if he were a real Continental Army officer. The shutter clicked, and he resumed his position, strolling back and forth on the hallway of a visitor’s center. 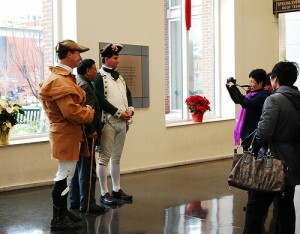 A historical impersonator, Nicholas’ job is to interact with tourists and help them feel a real sense of U.S. history. On any given day, he might chat with tourists, pose for pictures, give directions or answer questions about the American Revolutionary War. Whenever Nicholas cracked a joke, visitors burst into laughter — a response he says he always loves. “My presence makes their experience come alive,” he said. Nicholas, who has worked for Historic Philadelphia for 15 years, is one of the tens of thousands of employees in the multi-billion dollar tourism industry in Philadelphia, a city that would lose its vitality without funds tourism generates. In Philadelphia, tourism brought in $5 billion in visitor spending and $8.2 billion in both direct and induced business sales in 2009, according to the Greater Philadelphia Tourism Marketing Corporation. Tourism in Philadelphia galvanizes local hotels, shops, restaurants, and markets. It also keeps double decker buses for museums, local farms and construction sites busy. Visitor spending in Philadelphia resulted in $1.2-billion tax revenue last year, helping schools, libraries and other public services stay afloat, GPTMC data showed. Tourism in Philadelphia was a bigger employer than transportation, insurance, food stores and banking in the region last year, sustaining 83,664 jobs, or 5 percent of the total employment, the data showed. “If the tourism industry drops away, it will be a very sad and unfortunate thing to Philadelphia,” Nicholas said. While tourism is still a major industry in Philadelphia, recent numbers indicate Philadelphia’s tourism industry is being affected by the economic slowdown. GPTMC data show 36 million domestic travelers visited Philadelphia in 2009, down 1.9 percent from 2008, with visitor spending plunging 13.2 percent year-on-year. But Ethan Connor Ross, research director of GPTMC, said Philadelphia’s tourism economy has picked up again, citing a Smith Travel Research report on a 5-percent increase in hotel occupancy this year. Philadelphia Economic Index shows the city’s economy declining again since 2007 after years of slow recovery, with factories continuing to close. The city knows tourism can be a real economic and job booster. Philadelphia, the birthplace of American independence and democracy, has more cultural and historical relics than any other U.S. city – a great boon to tourism. The city is home to the most historic mile in America. It is home to the Liberty Bell, Independence Hall and Benjamin Franklin’s Grave among many other sites. Randy Garrison, 56, a tourist traveling from Dayton, Ohio, who was traveling with his wife, said he hoped to bring his children to visit Philadelphia. “They need to see the heritage and the history of the country,” Garrison said. Philadelphia has actually launched an aggressive and smart campaign to attract tourists for more than 10 years. This year, GPTMC, a main tourism promoter for Philadelphia since 1997, has decided its successful “With Love, Philadelphia XOXO” campaign, which started a year ago. Campaign posters and banners use no complex pictorial images. Instead, they use the friendly Post-it designs that carry only the slogan written simple in black and red. It aims to put Philadelphia on everybody’s list as a place to go. The slogan has been so popular that bars and bakeries in Philadelphia are actively using it for marketing their products, with a “With Love, Philadelphia XOXO” ale and a “With Love, Philadelphia XOXO” cheesecake. In June, Philadelphia became the world’s first city to showcase its tourist attractions via a mobile application to demonstrate how much it values tourism. The Find Your Philly mobile application features five tours, or “treks,” focusing on the city’s history; arts and culture; science and multicultural aspects; as well as the expanded convention center, due to reopen in March 2011. Convention business is another part that Philadelphia focuses on to boost international visitation. The ongoing $786-million expansion of the convention center would make it possible to host two major conventions simultaneously. In September, SugarHouse Casino opened its doors on the Delaware River waterfront. The city quickly connected SugarHouse to the public transit system in a smart bid to get tourists off the streets and into the casino. One of the tourism marketing successes in Philadelphia was the creation of a thriving business enclave in what was the brothel district. The “Gayborhood” area has turned into a bustling spot for trendy restaurants, cafes, bars, clothing stores and souvenir shops since it adopted its new name. GPTMC and other tourism agencies and sponsors have constantly supplied the district with things to enjoy and maintain vitality. In June, a three-week summer event featured a gay film festival, a photo exhibition and a block party. He said many restaurants, shops and cafes in the neighborhood are owned by the gay, lesbian, bisexual and transgender people. The shops carry “rainbow” stickers to demonstrate acceptance of all people, gay or straight. A few blocks away from the “Gayborhood,” Nicholas was still having fun with tourists at the Independence Visitor Center. Nicholas was demonstrating some of his 18th-century antique items – including an army sword, a bugle, a stylus pen and sheets of ivory for taking notes – to tourists. His friend “Trooper” Robert Hare joined him, spinning an old wood top on the hallway. 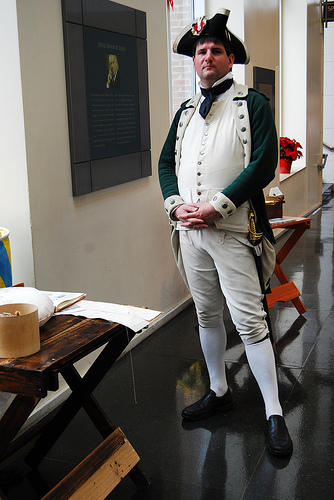 Hare, 37, an employee of Historic Philadelphia, was impersonating a member of the Philadelphia Light Horse Troop who escorted General George Washington, commander of the Continental Army. He wore an 18th-century hunting frock made of orange-colored thick cloth, a common garb won by American volunteer troopers. “If you find something that you love, you’ll never work a day in your life. -Benjamin Franklin,” Hare said. The witty notes, just like GPTMC’s smart campaign slogan, carried the same underlying message: Come visit Philadelphia.